The Allan Boettger Memorial Award was again presented for one last time - this year to Doris Winfield and Hazel Heistad (Honorary). We were down a little in registration numbers but still hosted a good tournament despite the Canadian Championships interfering some. 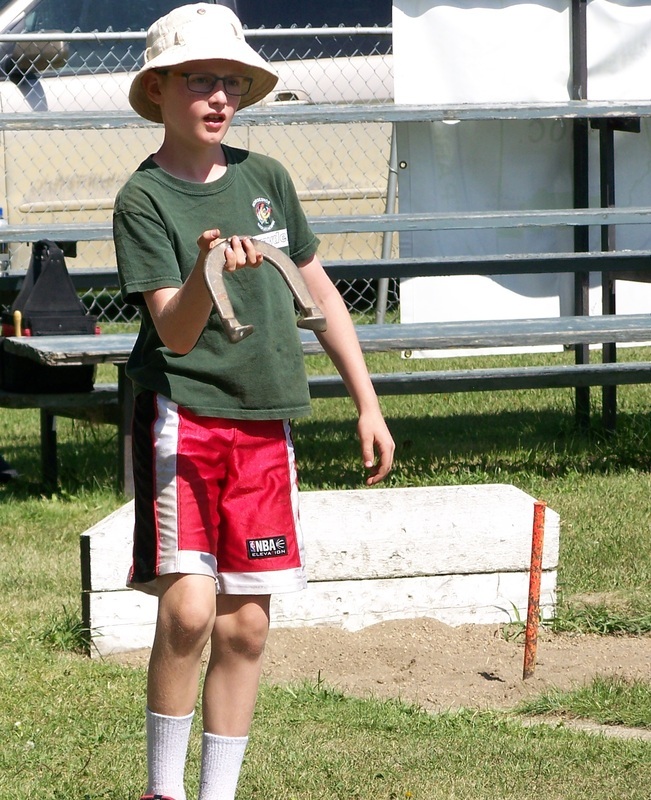 We did have a number of new players come to Bentley this year who really enjoyed playing horseshoes in competition. Deputy Mayor Neil Maki attended the opening, threw out the ceremonial first shoe, and welcomed visitors. He acknowledged seeing horseshoe players at the pancake breakfast saying he remembered serving them coffee. Horseshoe players do take in and support other town events while here! There were again 6 classes in two rounds of "Singles" play on a nice day on the Saturday. In the afternoon, some players chose to move to courts more in the shade to the west! 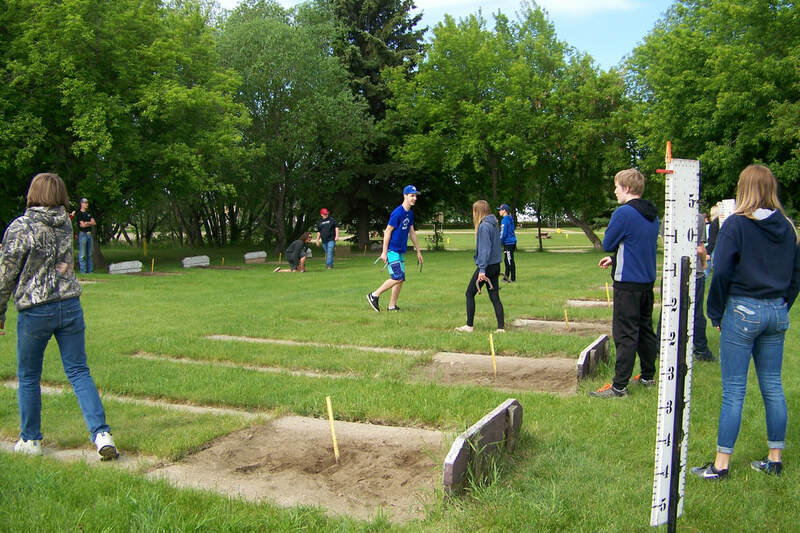 We have again applied to the Alberta Horseshoe Pitcher's Association and received permission for a tournament date on their circuit for August 10, 11, 2019 for next year. Time will tell if we can pull it off again. 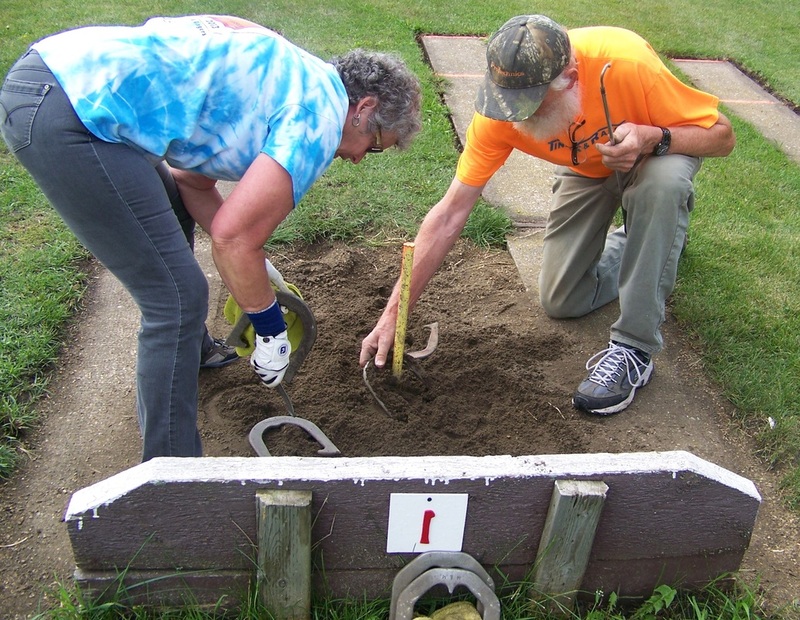 We need more active members and invite people to try horseshoes. The courts are open to the public. On the Sunday, in "Doubles" play, where you play with a given partner, there were 5 teams with handicap play. It was cooler and drizzly at the start but got better. After the round robin, there was a sudden death playoff as there was a tie for first place. The eventual winning team included a junior player, playing with a newer player. "Doubles" is a more fun and socialising kind of play that Bentley continues to believe in. Few other places offer it. This year's rodeo raffle saddle draw was won by a horseshoe player - Vic Preece - a wonderful extra-added surprise for him and for the Sunday horseshoe players. He is a horse rider so really appreciated the value of the saddle. It was nice to know someone that had won and was in attendance! 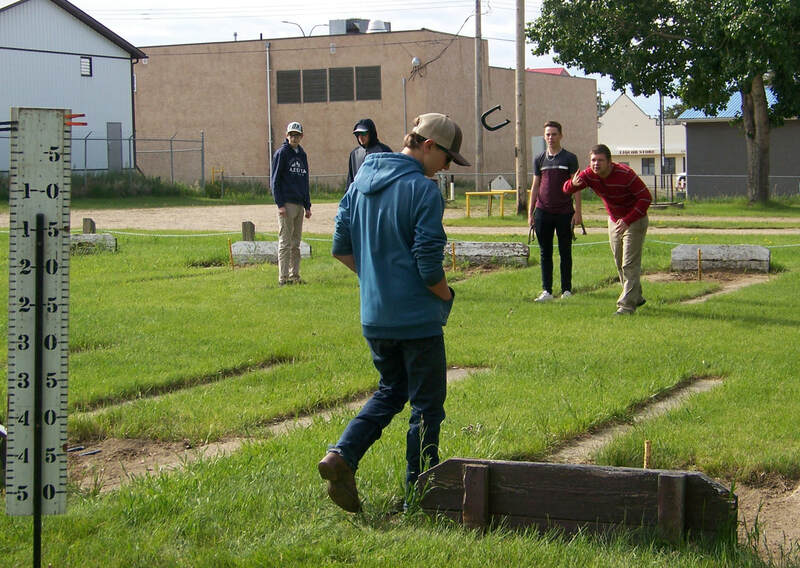 Thank you to a group of local high school students, who did the spring cleanup of the horseshoe playing area in June 2018, which really helped out the small horseshoe club. Students enjoyed instruction and play at later dates. There were 6 classes of "Singles" the first day with 29 Alberta and 4 Saskatchewan players including a class of Junior/PeeWee players with 5 players. Not many tournaments are able to hold "junior classes" anymore. Juniors weren't charged an entry fee, and all received prizes (costs covered by the club). The club also covered the cost of noon lunch for players. After prize presentations at the end of both rounds of play, an enjoyable potluck supper was held. We had a '150 Canada Anniversary' cake that was shared with everyone. On the Sunday, in "Doubles" play, where you play with a given partner, there were two divisions. There were 4 teams in each division, with a playoff between the winners of the two sections. Not many places still host a "Fun Doubles" day of play, but Bentley persists. Our club wants FUN to remain part of horseshoe pitching. We want people to mix and play with/against new people. THANKS TO: our team of Pearl, Cody, Hazel, June, Tammy, lunch volunteers and others who worked so hard! Bentley & District Ag Society, Servus Credit Union (Bentley),Teamworks Fabricating Ltd., Shir-Al Welding Ltd., Greg & Sandy Beavis, Bentley IDA Pharmacy, Crop Production Services (Travis Stoklosa, Bentley), Bentley Chiropractic Health Centre, KALTIRE (Jim Hancock, Lacombe), Sunny 94 FM (water), & Town of Bentley. 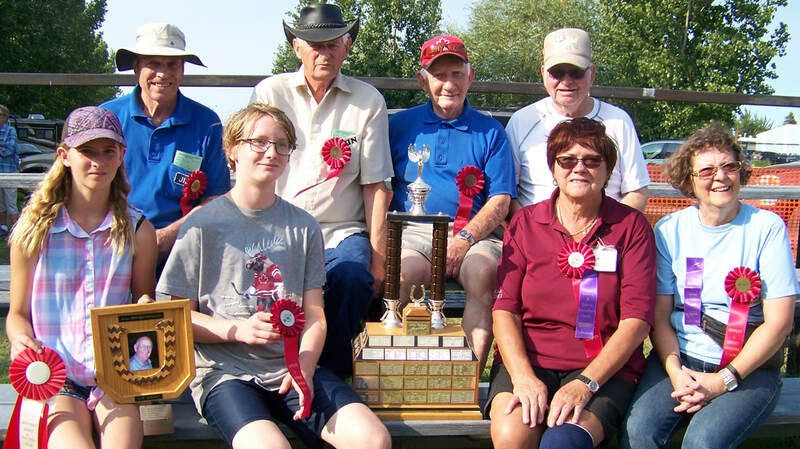 ​There were nine classes of “Singles” on the Saturday with the name of each class winner engraved on the John Talsma Memorial perpetual club trophy. Top winners in "Singles" play were: 30' Men's - Steve Moody from Wetaskiwin, second Lyle Olmstead out of a class of 5; Mixed A - Myrna Kissick from Innisfail, second Tammy Christensen from Regina out of a class of 4; Mixed B - Irene Nanninga from Spruce Grove, second Bill Hinds from Alsike out of a class of 6 (they were tied and had to play off); Mixed C - Paul DeGagne from Red Deer, second Winnona Kilbourn from Red Deer out of a class of 5. In the Mixed D there was a three-way tie. After the playoffs, first was Alex Wiersma from Red Deer, second was Clarence Hoffman from Wetaskiwin, and third was Jake DeGagne from Red Deer out of a class of 5. 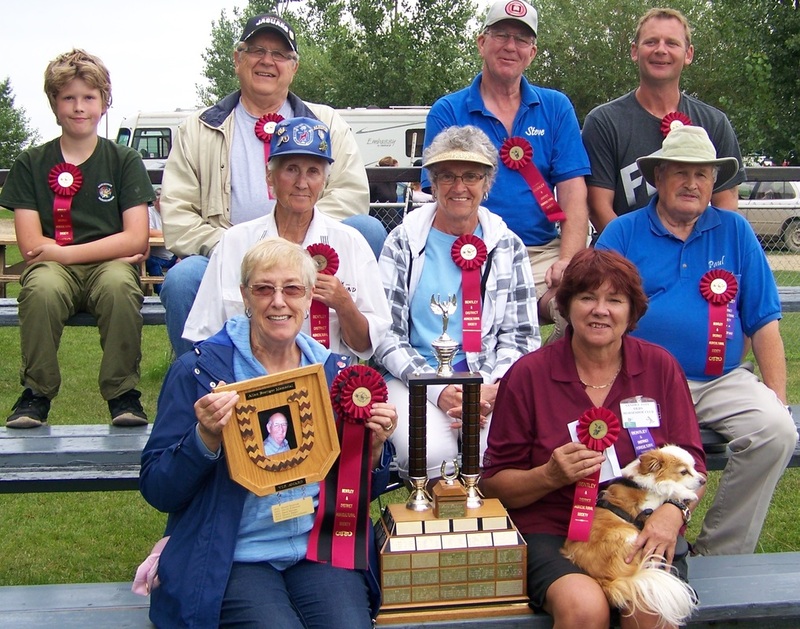 Winning Mixed E - Allen Budd, second Janice Drader from Wetaskiwin out of a class of 5; Mixed F - Omar Corbiere from Lethbridge, second Dave Hynne from Edmonton out of a class of 4; Mixed G - Sandra Jahn, second Olga Corbiere from Lethbridge out of a class of 4; Pee Wee - Garrett Christensen from Regina, second Brayden Christensen from Regina out of a class of 5. (Back row) Janice Drader and Riley Prevost, Alex Wiersma and Matt Coninx, Tammy Christensen and Ray Prevost. (Middle row) George Kollingson and Brayden Christensen, Betty DeGagne and Garrett Christensen, Alvin Nanninga and Jake DeGagne. (Front row) "B" winners Clarence Hoffman and Darcy Benoit, "A" winners Myrna Kissik and Wes Walker, second in "A" Irene Nanninga and Steve Moody. ​In “Doubles” play on Sunday there were two groupings for the nine teams with the winning team's names engraved on the club's Doubles perpetual trophy. 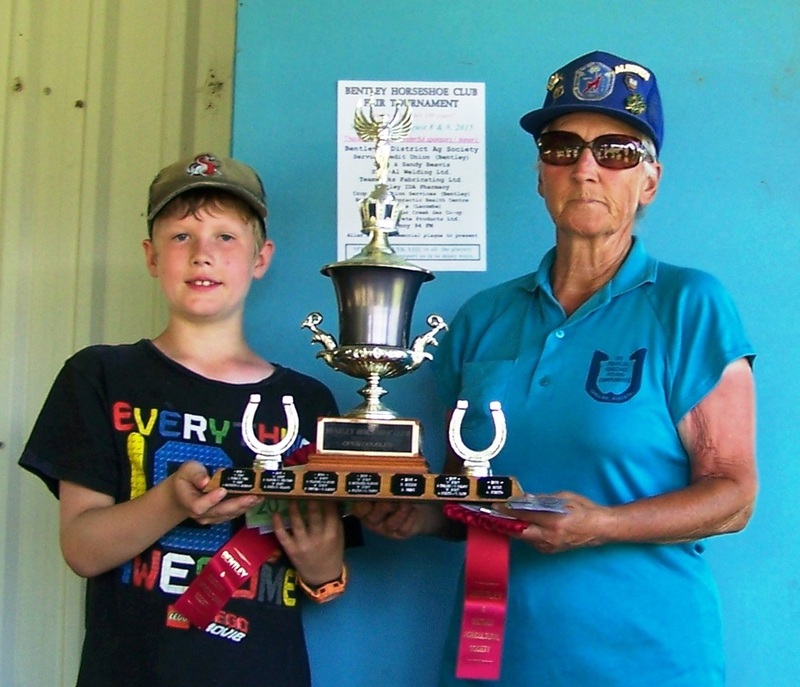 Winning all of their games in the "A" Division were Myrna Kissick from Innisfail and Wes Walker from Surrey, B.C. and winning all of their games in the "B" Division were Clarence Hoffman from Wetaskiwin and Darcy Benoit from High River. Second in the "A" was Steve Moody and Irene Nanninga. Second in the "B" was Janice Drader and Riley Prevost. ​The horseshoe courts were busy for the Bentley tournament. This is a glimpse at some of the play. Two players, Irene Nanninga and Alex Wiersma, take a close look before agreeing on the count at the Bentley horseshoe tournament. 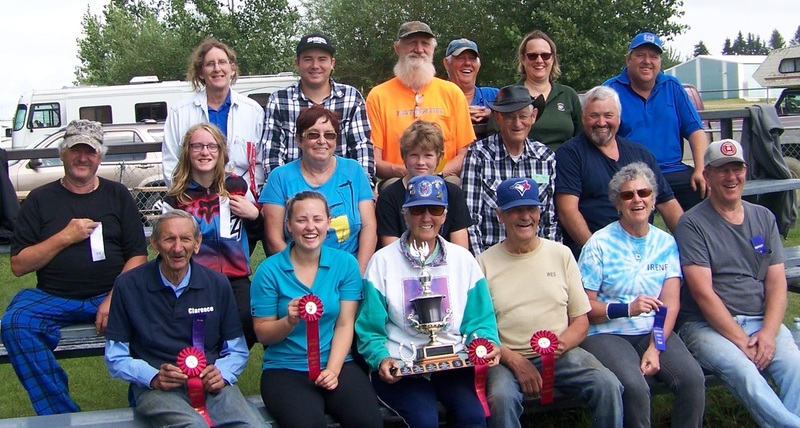 A BIG THANK YOU to all, including club members, the volunteers and players, donors and sponsors, and everyone else who continue to support our August fair/rodeo horseshoe tournament. There were five classes in Singles play at the Bentley Horseshoe Tournament on Saturday, August 8. Each class winner's name is engraved on the John Talsma Memorial perpetual club trophy. Plans are to hold our 2016 tournament on August 6, 7 with Bentley's annual fair/rodeo again if we can. We need more club members to continue. 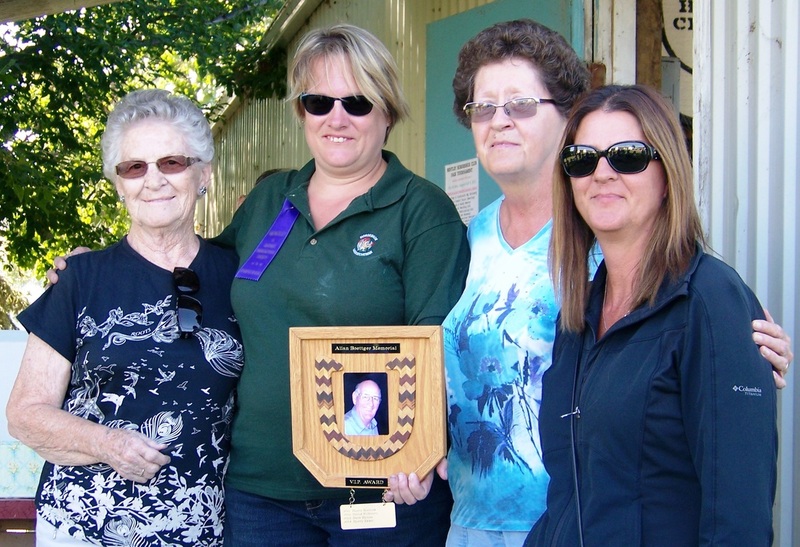 On hand for the Allan Boettger Memorial award presentation were Allan's sister Hazel Heistad, 2015 winner of the award Tammy Christensen, Allan's wife Pearl Boettger, and daughter Sharon Schrauwen from Red Deer. The 2015 recipient of the Allan Boettger Memorial V.I.P. Award, started in 2011, was Tammy Christensen from Regina. Allan's wife Pearl had daughter Sharon Schrauwen from Red Deer make the draw. Back row: Joan Miller, Tammy Christensen, Kevin Cuthbert, Bruce Grandel, Terry Zukiwsky, Cindy Ekkel. 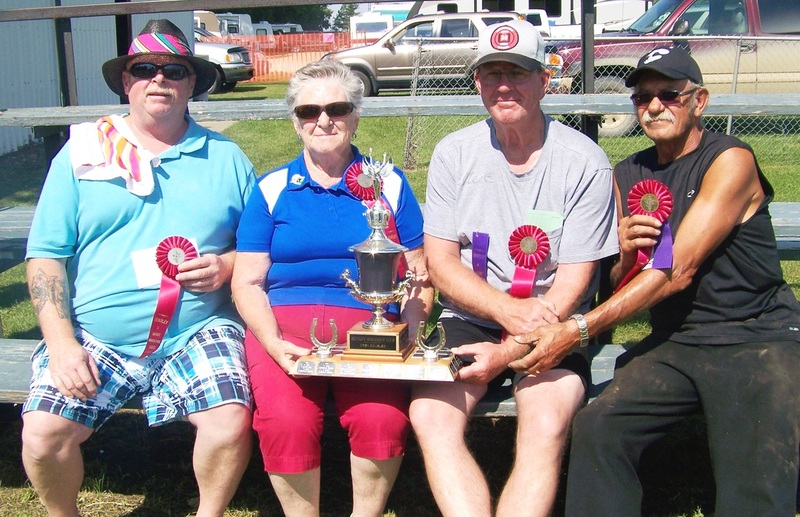 Middle row: Wies Valckx, "B Mixed" winner Bill Hinds, "D Mixed" winner Esther Hoerle, Marion Wilson, Myrna Kissick. Front row: Con Taks, Emvie Antonio, Brayden Christensen, Garrett Christensen. 40 Foot Men - Steve Moody from Wetaskiwin. 2nd - Bruce Grandel from Calgary. 3rd - Kevin Cuthbert from Calgary. Mixed A - Lyle Olmstead from Claresholm. 2nd - Tammy Christensen from Regina. 3rd - Myrna Kissick from Innisfail. Mixed B - Bill Hinds from Alsike. 2nd - Matt Coninx from Innisfail. 3rd - Charlie Whatley from Innisfail. Mixed C - Stuart Little from Innisfail. 2nd - Noel Peterson from Ponoka. 3rd - Con Taks from Innisfail. 4th - Jean Miller. Mixed D - Esther Hoerle from Innisfail. 2nd - Brayden Christensen from Regina. 3rd - Dave Hynne from Edmonton. 4th - Terry Zukiwsky from Gull Lake. 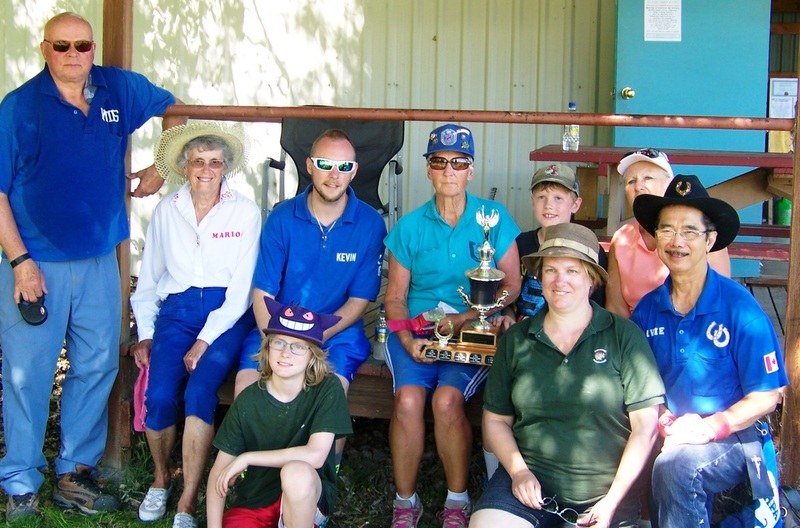 Back row: Wies Valckx, Marion Wilson, Kevin Cuthbert, "Doubles" winners Myrna Kissick and Garrett Christensen, Kay Born. There were five teams August 9 for “Doubles Play" on Sunday. Top winner gets their names on the annual perpetual trophy and top prize money. Junior player Garrett Christensen from Regina and Myrna Kissick from Innisfail. Winning junior Brayden Christensen getting set to deliver a shoe. Back row: 2nd place Harry Ekkel, 4th place Clarence Hoffman, Ray Prevost, 4th place Brayden Christensen, 5th place Logan Mehls. Center row: Cindy Ekkel, 2nd place Kay Born, 5th place Hazel Heistad, 3rd place Elaine Sanderman and partner Winnona Kilbourn. Front row: junior Cheyenne Yellowbird, 1st place partners Clarence Sanderman and Tammy Christensen holding the annual perpetual Doubles trophy, 5th place Garrett Christensen, and junior Troy Mantai. The 50/50 draw winner was Len Tabler from Wetaskiwin. 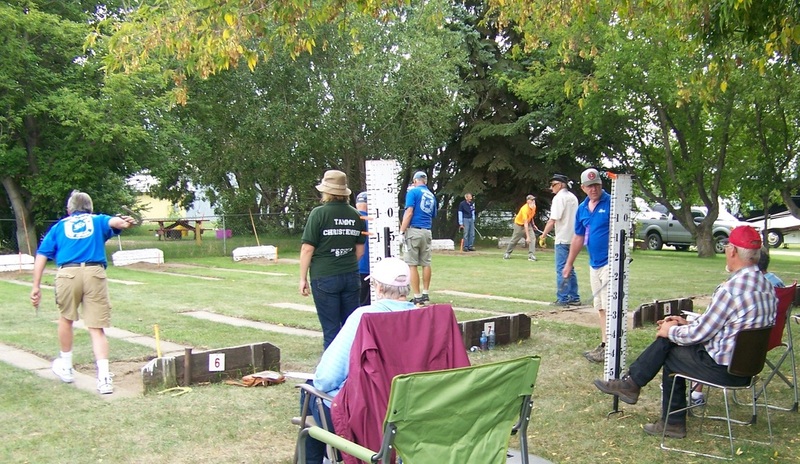 Some horseshoe players in action August 10, 2014. Harry Ekkel was presented with the annual Allan Boettger Memorial V.I.P. Award by club statistician Pearl Boettger. Back Row: Ray Prevost, Clarence Hoffman, Matt Coninx, George Beutler, Hazel Heistad, Kay Born, Cheyenne Yellowbird. 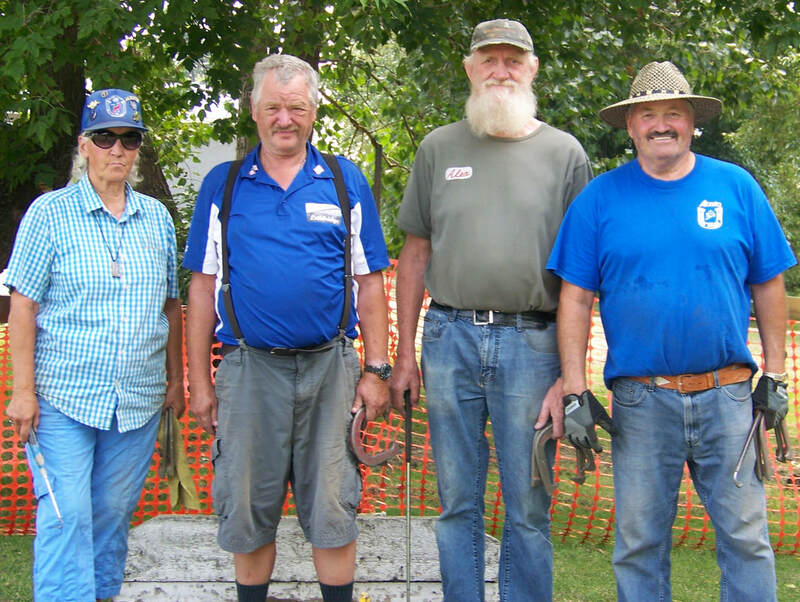 Centre Row: Charlie Whatley, Clarence Sanderman, Tammy Christensen, Elaine Sanderman, Winnona Kilbourn. Thank you to all the gracious Tournament Sponsors who Supported our 2013 Tournament! !